Hubs & I pimping our ride! J. K. Rowling’s Harry Potter fantasy series gained worldwide attention, won multiple awards, and sold more than 400 million copies. In fact, the Guinness Book of World Records lists Harry Potter as not only the best-selling book series in history but the highest-grossing film series in history. Only the Bible has more translations. And I should probably mention she became the first billionaire author on the entire freakin’ planet. 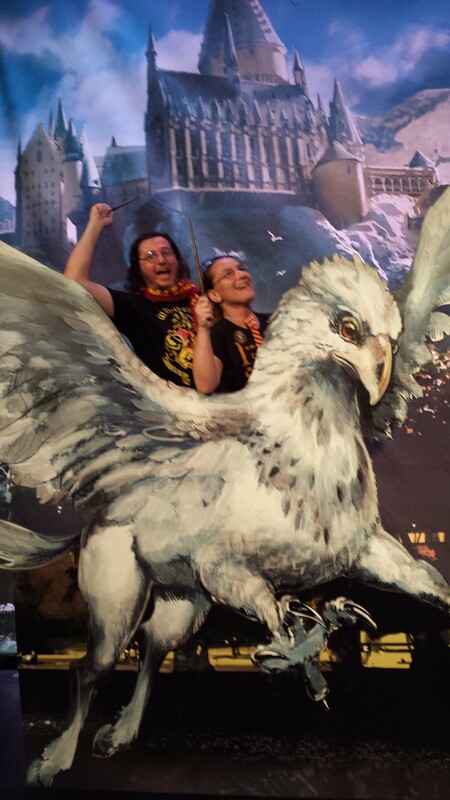 As I walked around Universal Studios for the Harry Potter Celebration this past weekend, on the heels of my 18 Thoughts release, all of those ‘thoughts’ on her instant success made this struggling author wonder if Jo really does know magic. I mean, she was the same as me when I started . . . an unpublished nobody. No connections in the business. No money to hire an editor to proofread her work or a publicist who could reveal the secret to marketing success. So, how did she do it? Well, I did some recon when I returned for my trip, and it turns out, Rowling and I started out differently in a HUGE way. *Confession time* My name is Jamie, and I’m a pantser. Rowling, on the other hand, planned Harry Potter for FIVE YEARS after she first birthed the idea during a train ride. Have you heard of the 10,000 hours of practice theory? Author Malcolm Gladwell says it takes roughly ten thousand hours of practice to achieve mastery in a field. You can read more about his theory here. If I divide 10,000 by 5 years, I get 2,o00. Then if I divide that number by 52 (# of weeks in a year), I get 38.5 . . . assuming Jo put that much time in every week working on HP (and judging by most Neurotic Authors like myself, I’m betting she did), she meets the criteria of putting in 10,000 hours of ‘practice’ before becoming a worldwide phenomenon. I started writing in the summer of 2009. I finished the last book in my trilogy in the summer of 2014. I’ve put in the practice. And now . . . I’ve actually planned out my next book! Success is always a struggle. My recent release left me feeling depressed. But I’m not going to think about the sales. I’m going to be laser focused on my writing this next year. I know it’s unrealistic to think I’ll be the next JK Rowling (and really, the world doesn’t need another JK Rowling . . . we are each created to do our own unique thing in this world), but I don’t believe in magic (okay, let’s be honest, I’m still holding out hope for my letter to Hogwarts). I believe in hard work. It’s the only way to get to where you need to go. And I don’t care if it takes me another five years . . . In my first novel, 18 Things, the main character writes a life list of eighteen things to do the year she’s turning 18 at the suggestion of her therapist who is trying to help her overcome the grief of losing her best friend. Writing a novel was at the top of my own bucket list, something I wrote after my cousin’s son was diagnosed with leukemia. I never meant for my novel to turn into a trilogy, never meant to start another career as an author. I simply didn’t want my life to end with a bunch of things unchecked on my to-do list. I’ve enjoyed this journey I’ve been on since the summer of 2009, but it’s been a series of trade offs. Finding balance between writing and everything else going on in my life has been a challenge. And I’m sure you’re all nodding your head along to my words . . . if you’ve even had time to read this far! My sequel, 18 Truths, is all finished and will release on January 28, 2014. So I decided to use November (National Novel Writing Month) to try and write my last installment in the trilogy, 18 Thoughts. This is the first time I’ve attempted NaNoWriMo, and I think I’m doing well so far with a total of 20, 727 words. But the writing is bittersweet. I honestly don’t know if I’ll pursue publishment again once the trilogy is complete. There are simply too many other things on my to-do list that I want to cross off, and I’m finding there aren’t enough hours in the day to accomplish them all. Of course, that doesn’t mean I’ll stop writing. That would be like someone telling me to stop breathing. And I’m not saying I’ll never publish another novel . . . maybe I will in ten years or so after my youngest spawn has left the nest. Maybe by then I’ll have so many adventures to write about, I won’t ever be able to stop. We’ll see. What about you? How do you balance the demands of your muse with the demands of every day life? Participating in NaNoWriMo this year? We all have a book in us waiting to be written . . . it’s never too late to add it to your to-do list! And if you do, please visit the Insecure Writers Support Group to help you on your journey. We post the first Wednesday of every month!